Umkhanyakude District Municipality is situated in the north-eastern region of KwaZulu-Natal. The district extends from Mtubatuba (St Lucia) in the south to Kosi Bay in the north, across to the Lubombo Mountains in the west. The district is strategically linked to the provincial markets of KwaZulu-Natal and Mpumalanga and to the neighbouring market of Swaziland. The district consists of the local municipalities of: Jozini, Mtubatuba, uMhlabuyalingana and Big 5 Hlabisa. A high proportion of this rural district is under thicket, grassland and wetland, while remaining areas are cultivated land and settlement. Large areas of land are under communal tenure, located in the traditional authority areas under the jurisdiction of the Ingonyama Trust. The remaining areas are under state conservation or private ownership with limited formal urban areas. The Umkhanyakude District is home to the Big Five animals and offers year-round tourism experiences with mild winters and hot summers. The Big 5 Hlabisa Municipality is located in one of the world's richest and diverse tourism areas. 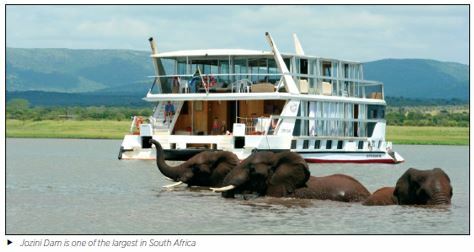 World renowned game and nature reserves such as St Lucia, Hluhluwe/Umfolozi and Mkuze are located here. Easily accessible off the N2 National Route, it incorporates part of the iSimangaliso Wetland Park and is the starting point of the Lubombo Spatial Development Initiative corridor, which links Hluhluwe to Mozambique. The town of Hluhluwe, which contains major shopping and light servicing facilities, as well as the municipal offices, services the municipality. traditional communities (Makhasa, Mnqobokasi and Nibela). The Jozini Municipality is located in northern KwaZulu-Natal and borders Swaziland and Mozambique. The Lebombo Mountains and Makhatini Flats provide a diverse and beautiful terrain, which has many local resources, including water features and even fossil sites. Both Ndumo and Mkuze Game Reserves can be found straddling the borders of the Jozini Municipality. Jozini town is the access point for northern Maputaland. It is a small business centre situated close to the impressive Pongolapoort Dam, better known as the Jozini Dam, one of the largest in South Africa. This dam is designed to irrigate more than 80 000 hectares of agricultural land supporting products such as sugar cane, rice, coffee, cotton, fibre crops and various subtropical fruits. The dam draws its water from the Pongolo River, which means '' trough'' and is the principal river of Maputaland. The Pongola River, in its path to the sea has given birth to a series of oxbow lakes and pans that are teeming with fish and bird life. Supporting a massive population of fish, crocodiles and hippos, as well as the people of the area, it is an integral part of the economy of the region. Tourism has been prioritised as the major economic development opportunity and its success is dependent on local community initiatives as well as the natural beauty of the surrounding landscape. Mtubatuba Municipality is situated along the northern coastal belt of KwaZulu-Natal. Mtubatuba is the most urbanised local municipality, as Mtubatuba town and St Lucia are the main towns within the district. Mtubatuba town is a strong sub regional commercial, service, transport and administrative centre for the entire north eastern Zululand region. In the past few years there has been substantial commercial growth in Mtubatuba with retail and wholesale outlets opening. The town is ideally located as a base from which to explore the rich culture of the Zulu nation and world renowned game reserves and the iSimangaliso Wetland Park which is about 25km away. 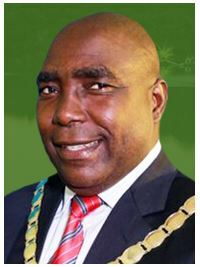 The Umhlabuyalingana Municipality consists of a number of District Management Areas that fall under the municipal jurisdiction of the district as well as the urban settlements of Manguzi, Mbazwana, Mseleni, Sikhamelele and Mboza. Umhlabuyalingana like many other municipalities in the country, has a huge service backlog. Tourism is increasingly making a greater contribution to the local economy. The municipality has an abundance of natural assets. The entire coastal strip of uMhlabuyalingana has been designated a district management area that is administered by the greater iSimangaliso Wetland Park Authority. Heritage Sites include: Maputaland marine reserve, iSimangaliso Wetland Park, St Lucia Lake System, turtle beaches and coral reefs, Lake Sibhaya (one of the largest natural fresh water lakes in South Africa covering an area of 7,218ha), Kosi Lake System, Ndumo Game Reserve; Sodwana Bay; and Tembe Elephant Park which is endowed with a diversity of wildlife as well as magnificent sand forest patches. A model District Municipality in service delivery excellence. A simple, focused and goal driven service delivery programme with measurable results.